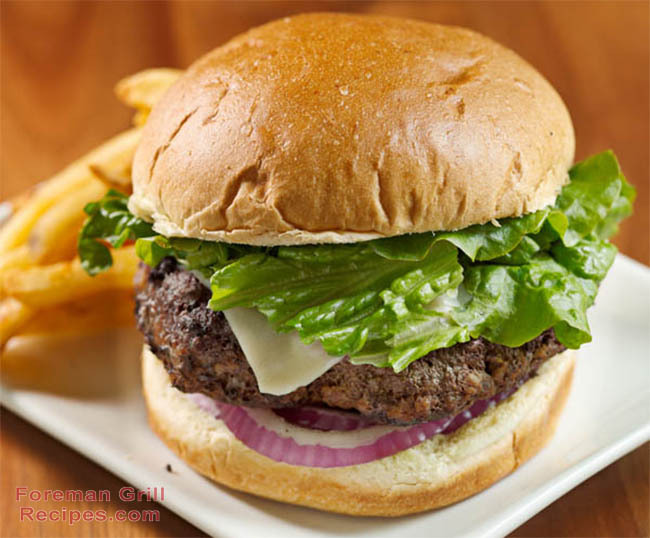 Burgers are one of the most popular items to cook on your George Foreman Grill. Grilling is always the preferred method to prepare a burger and doing so on the George Foreman Grill is very simple and extremely satisfying. Preheat your George Foreman Grill. Combine ground beef, Worcester sauce, liquid smoke, parsley and salt/pepper in a bowl and mix all ingredients by hand for about 1 minute. Make sure to mix all ingredients well and evenly. Shape into 3 patties of approximately 1/2 inch thick. Place patties on preheated grill and cook for approximately 3-5 minutes for medium rare, 5-6 minutes for medium, 6+ minutes for well done. Cooking times will vary depending on size of burger and grill. You’re really going to want to keep an eye on the burger in the 3-5 minute range. That’s the best average cooking time, especially for a 1/2″ think patty. When burgers are done to your likeness, remove from grill and toast buns for 2 minutes on inside. Buns can be brushed with butter or margarine if desired. Serve with your choice of toppings including fresh iceberg lettuce, beefsteak tomato slices, onion, ketchup, mustard. I’m so excited, for receiving my brand new GFG ! I’M checking alot of recipes ! Tomorrow is Burger night, woo hoo! If I buy pre-formed patties that are frozen, should I defrost the patties first? No!!!! I buy them frozen and slap them on the grill frozen. They come out great! 1/4 lb frozen burger: 5 min. pre-heat. 6-7 minutes cook time. Costco pre-cooked Angus burgers are the best! My hamburg was bought and is smaller in size so it won’t take as long. Thanks for the info. I like to put butter on a bun and then after the hamburger has cooked on the George Foreman grill for a little while I put the hamburger on the bun. Then . . . I eat it.